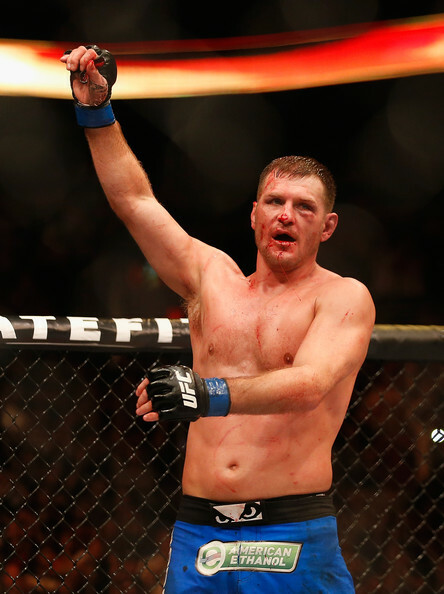 The Heavyweight Curse – Can Stipe Miocic win a belt and keep it? Home / MMA / Will Raczkowski / The Heavyweight Curse – Will Stipe Miocic be the First Heavyweight Champion With Multiple Title Defenses? One perfectly timed counter-punch was all it took to silence a crowd of 40 thousand screaming Brazilian fans, and bring Cleveland, Ohio its first mainstream sports championship. Stipe Miocic went from a hungry young prospect, to a genuine title threat, to the UFC Heavyweight Champion of the world in just 4 short years, bringing athleticism and movement that seemed more fitting for a middleweight than a 240 pound monster of a man. The former standout collegiate baseball player and decorated amateur wrestler outstruck the Brazilian jiu-jitsu wizard Fabrico Werdum, putting the stamp of dominance on his opponent with a face-plant KO as “Vai Carvahlo” rushed in aggressively after the American phenom. Now the UFC finally has what it has been missing for so long, a young, healthy and exciting heavyweight champion who has no major injury history and the skills to put butts in seats. However, the heavyweight curse still stands between the UFC’s ability to effectively market their heavyweight champion. The Ultimate Fighting Championship has had 15 Heavyweight champions, but of all those to wear gold, none have been able to defend their title more than twice. When 265 pound men are swinging for the fences at one another, it leaves little room for error, and as a result, the need to be perfect when defending your title is substantially higher as the power punching reaches its peak. Cain Velazquez seemed dominant until Junior Dos Santos dropped him with an overhand, before Dos Santos was eventually crushed by Velazquez in the return fights. Velazquez was able to muster two title defenses between massive lengths of injury layoffs before finally relinquishing his title to Werdum, who lost his first defense to the young-gun Miocic. The cycle is a vicious one, and until Stipe the division struggled to produce truly high level young talent. As men of that size and athleticism typically go to the massive paydays of football and baseball, rather than fight for a lesser paycheck in the UFC, Miocic has the opportunity to turn that tide. He can lead the charge for a new breed of young heavyweight athletes into a division that desperately needs new blood. Stipe has the chance to create history. At only 33, the Croatian-American fighter is articulate, remarkably athletic, injury free and a born finisher. In a heavyweight division that allows 37 and 40 year old fighters to entrench themselves in the top 5, a fresh young face has the ability to really weaponize their youth and minimal wear and tear to rattle off a significant amount of defenses in a division that desperately needs to develop young talent. One right hook was all it took to get the belt, but it was movement, hard work and intelligence that got him to that fight. Stipe Miocic is the real deal, and looks to make his claim as the baddest man on the planet. Will he break the curse and become the baddest man of all time? Time will tell.